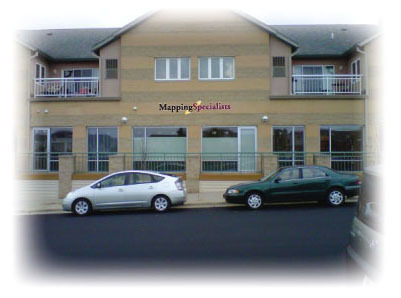 Yes you read it right, Mapping Specialists is moving. On Monday, November 8, 2010, we will be working from our new location at 3000 Cahill Main, Suite 220, Fitchburg, WI 53711-7154. (Our telephone and fax numbers and website address will remain the same.) We are only moving a little over a mile, but changing cities! On many maps Fitchburg appears to be a very large suburb of Madison, but the town actually has only around 25,000 residents, and our new neighbors pride themselves on the small-town feel of their community. While moving an office is no easy task, I think we are in pretty good shape. With a little planning and organizing the move should go smoothly. It’s been 23 years since our last move, so the biggest challenge is sorting through literally decades of accumulated “stuff.” Some call this stuff cartographic memorabilia, while others—including myself—fondly call it junk. Though some of it truly is junk, we have found items that bring back memories of a bygone era in cartography. Scribers, scribe coat, clear Mylar, drafting pens, opaque—all remind us of how labor-intensive mapmaking once was. And the early versions of software, data tapes, and archaic hardware make us appreciate the relative speed and efficiency of modern computer mapping. Many of these pieces will find their way into a small “History of Mapping Specialists” display at our new facility. I’m very excited about the new office. Though it is smaller than our current location, the efficiencies that the new space creates mean we can better meet your needs. The office is located in a business/retail complex, so part of our space will be devoted to retail sales. This won’t be a large storefront, only about 350 sq. ft., but enough to offer visitors a nice selection of map products. We have a surprising amount of walk-in retail traffic at our current off-the-beaten-path location. It will be exciting to see how many people will stop in when we relocate to a complex that has over 2,000 visitors daily, and exposure to more than 140,000 commuters per week. So, if you try to contact us via phone, fax, our website, or email Friday through Sunday, November 5–7, and either can’t get through or we are slow in responding, you’ll know what we are up to. You can expect us to be back up to full speed on Monday, November 8th. At least that is the plan—wish us luck! 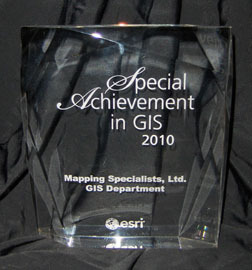 We are honored to announce that Mapping Specialists received a “Special Achievement in GIS” award from Esri, the world’s leading developer of geographic information system (GIS) software, at the annual Esri User Conference held in San Diego in July. MSL received the award for our extensive implementation of GIS technology within the company and our leading use of GIS for cartographic database development, including our work on The Ultimate United States Road Atlas, published last fall by HEMA Maps. MSL was among a select group of organizations honored as a result of a nomination process that started with recommendations from Esri staff to a company awards committee, which then forwarded a select group of entries for personal review by Esri founder Jack Dangermond. Eligible organizations include federal, state, and local governments, as well as private companies, universities, and non-profits from around the world that use GIS to produce their map products. Winners had no knowledge of their nominations until notification of their selection for the award by Esri staff. The Ultimate United States Road Atlas is the first seamless, continuous-scale road atlas of the United States created using ArcInfo® software from Esri, incorporating an extensive GIS database to power the map while implementing Esri tools to replace old manual workflows. The result has been improved cartographic quality and quicker map production, all while maintaining data integrity. Implementing new tools to replace old cartographic processes is not new at MSL. We were among the first in the industry to convert to computer-only cartography, when we saw how new software and hardware could increase productivity, decrease costs, and help us better serve our clients. We are now working with Esri staff to help them review and improve their exporting, printing, and cartography tools. 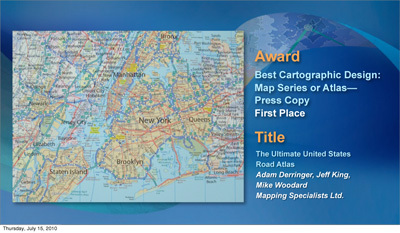 MSL also received a second honor at the User Conference, an Esri Map Gallery award for “Best Cartographic Design: Map Series or Atlas—Press Copy.” An expert panel of cartographers and map designers reviewed hundreds of maps on display by invitation in the annual Esri Map Gallery at the User Conference. A PDF with the complete set of this year’s winners, including MSL’s entry, is available at the link below. 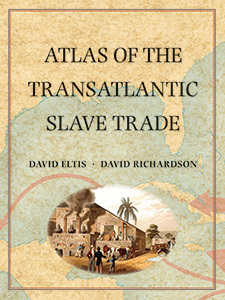 This is just a sample of the advance praise for the Atlas of the Transatlantic Slave Trade by David Eltis and David Richardson, to be published in November by Yale University Press. The work presents the first comprehensive, modern atlas by two leading experts in the 350-year history of the slave traffic involving Africa, Europe, and the Americas. The work contains almost 200 maps that Mapping Specialists created just for this volume. The atlas presents in map form the data contained in the online Transatlantic Slave Trade Database, which includes records for nearly 35,000 slaving voyages, roughly 80 percent of all such voyages. The database is the product of decades of work by an international team of scholars who compiled and verified information about individual slave ship voyages. MSL worked for over four years with the authors, as well as with an advisory panel and staff at Yale University Press, to develop the maps reproduced in the atlas. Many of the maps also have accompanying charts, designed to enhance understanding of additional elements of the slave trade. Additionally, the atlas contains a selection of illustrations and contemporary literature, including poems, letters, and diary entries, depicting the human side of the story underlying the slaving data presented. For Mapping Specialists, Ltd., every client is important, of course, but our work on the Atlas of the Transatlantic Slave Trade has been among our most significant projects in terms of its potential impact on scholarship as well as its appeal to general audiences. We are extremely honored that Yale University Press and the authors chose MSL to create the maps for this groundbreaking work. The atlas will be available for purchase from the press on November 8.